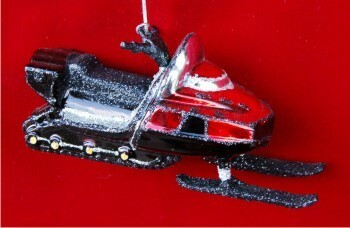 Between 1908 to 1924, various snowmobile-like contraptions were made by individuals trying to solve business problems. 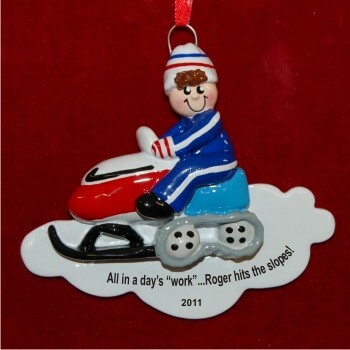 One man, for example, needed to haul logs out of a mountain pass over the snow. 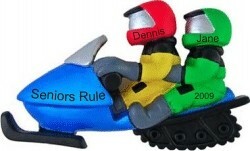 He took a car engine, put skis on it, and it a revolving track made a revolution or two. It wasn't very workable as it frequently sank in the snow. Marginally workable designs popped up in various places across the US and in Europe. However, in 1924 Earl Eliason of Wisconsin took a toboggan, strapped skis on the bottom, created an endless track, and powered the track with a 2.5 HP gas engine. The toboggan worked and is now accepted as the prototype for today's modern snowmobiles. Today's motors are made specifically for the shifting and power requirements of movement across the snow, and most utilize the endless track design with skis in front we see today. 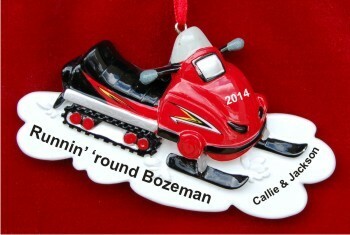 Order a snowmobile ornament personalized for one person or for two people. 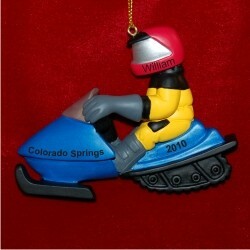 Each of our snowmobile Christmas ornaments arrives in our exclusive black velvet bag, ready to make a great personalized Christmas ornament gift.